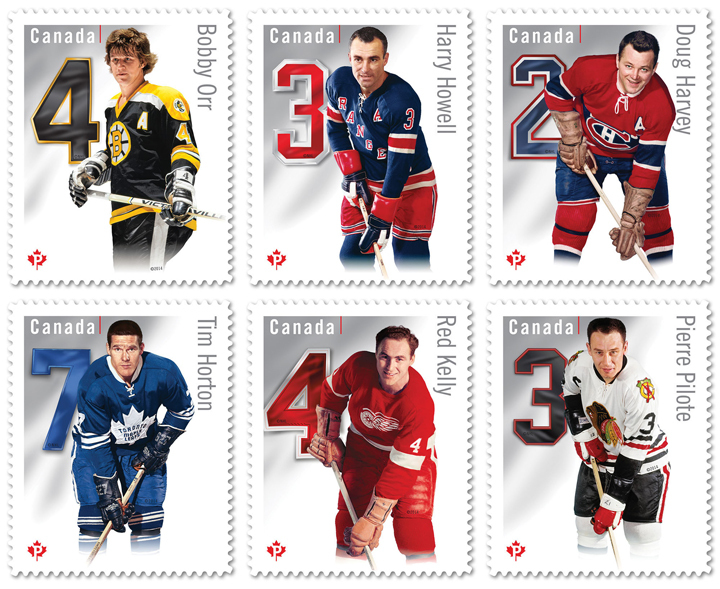 Canada Post has recently issued new stamps honouring former star NHL defensemen Bobby Orr, Harry Howell, Doug Harvey, Tim Horton, Red Kelly and Pierre Pilote. They’re really quite attractive. A friend of mine who works for Canada Post suggested I write something about this, so I tried to find a little bit of history. It seems that several countries have issued hockey-themed stamps (usually around the Olympics or World Championships) for many years. Looks like the first time Canada did so was on January 23, 1956. An announcement about it appeared in Canadian newspapers on December 9, 1955. The story claimed that former Liberal Member of Parliament for Toronto Trinity Lionel Conacher (who had died of a heart attack during a House of Commons-Parliamentary Press Gallery baseball game in the spring of 1954) gave “strong sponsorship” to the hockey stamp. Conacher, of course, played in the NHL from 1925 to 1937, and also starred in football, lacrosse and several other sports. He was named Canada’s Athlete of the Half-Century in 1950. Here’s a look at that 1956 stamp. Hi Eric! What great stamps; they are colorful…Bobby Orr was such a cutie when he was younger!! (LOL but I digress). 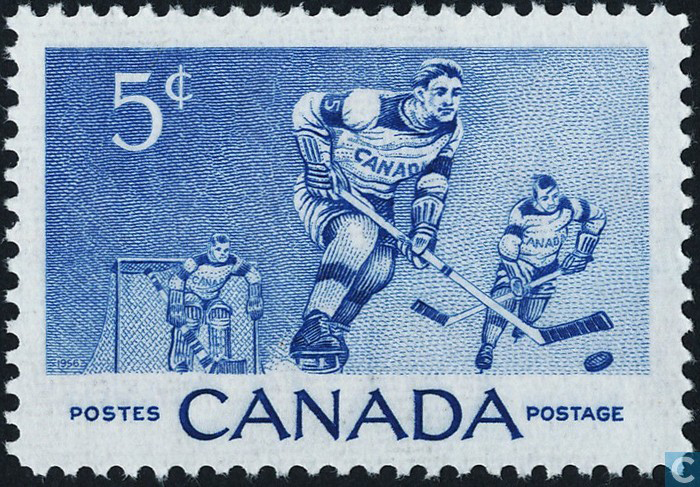 I will have to check my stamp collection to see if I have that 1956 Hockey stamp…. Those are some seriously nice stamps. They’ve done a really nice job, bright colours, clear pics. And the player selection for each team is creditable as well. Well done Canada Post! Oh, and you too, Eric. 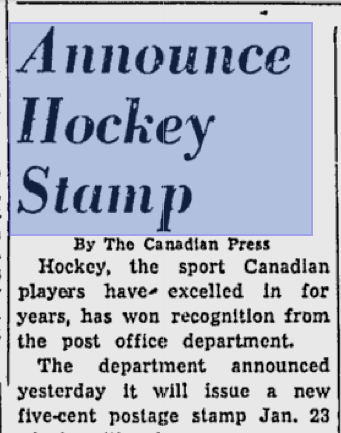 Haha I like the wording in the article “won recognition from the post office department” as if they had staunchly refused to recognize hockey in general at all prior (I know that’s not what they meant, I just like to imagine). Canada Post did a really nice job with these – which are so much better than a series of muddy efforts released in the early 2000s around all star game time. The 1956 stamp is the only one of our hockey stamps to be steel engraved — there is something really classic about that process, which has been abandoned in favour of cheaper printing options. Sweden is one of the few countries that still engraves some of its postage stamps – including a few hockey stamps in the past decade.